Ma Po tofu reminds the writer of her mother’s cooking. Nestled in an unassuming strip mall in New Town, Sister Noodle House is as far from the flash of Duval Street as you can get. But with huge portions of arguably some of the best Asian cuisine on the island at über affordable prices, it should be on everyone’s radar. I quickly became a fan after my first meal here. It was a rainy day, I was beat from work, and all I wanted was a bowl of noodles to fill me up. What else do you order from a joint with the word “noodle” in its name, right? Upon arriving, you’ll probably be greeted by the owner, Peng Lee. He runs the show at Sister Noodle and is the perfect host. On my last visit, he told me to sit anywhere, so I parked it at a corner table and ordered a Coke and dumplings. Being part Asian myself, I have always had an obsession with dumplings. I swear, my mom has made more dumplings in her lifetime than McDonald’s has sold burgers. So suffice to say, your girl knows a thing or two about dumplings. The dumplings at Sister Noodle are by far the best in Key West (just don’t tell my mom!). They are delicious, moist and filling, and you can choose to have them steamed or pan-fried. I bet you can guess how I had mine — pan-fried all the way. 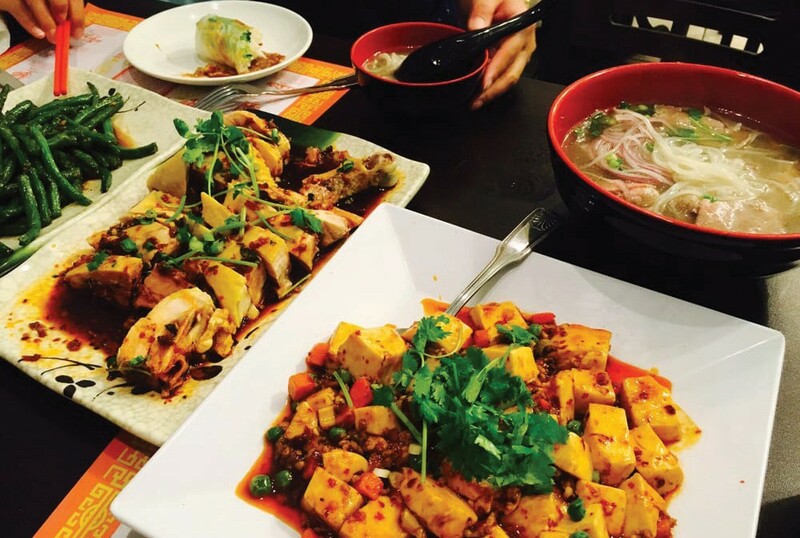 With an extensive menu offering everything from rice to noodle dishes, it’s always hard to decide what to eat at Sister Noodle House. The drool-worthy photos on the menu never seem to help, either. Once I think I’ve made up my mind, I see something else that’s appealing. I finally narrowed it down to my go-to: Ma Po tofu, a traditional Chinese dish consisting of tofu, ground pork, peas and carrots sautéed in a yummy brown sauce and topped with white or brown rice. It’s my all-time favorite dish because it reminds me of my mom’s cooking. It’s comfort food that’s good for the soul (or at least this is what I tell myself). Since it has tofu in it, I can also convince myself that it’s healthy, so I usually eat it post workout, willfully neglecting the fact that it’s cooked in that rich, indulgent brown sauce. As I waited for my meal, I enjoyed catching up with Peng. It’s hard to believe it’s already been five years since he moved to Key West and opened Sister Noodle House. Quick-witted and funny, Peng loves Key West, especially being on the water and fishing, and he always makes me feel right at home. Every time I come in, he knows exactly what I’m going to order and asks me how my family is doing. It’s this type of personal connection that keeps me coming back time and time again (and also the dumplings, let’s be honest). The restaurant is adorned with your typical kitschy Asian art and has a cozy vibe. It’s intimate and inviting. There is a window where you can look into the kitchen and watch the chefs preparing your dishes. You feel right at home at Sister Noodle House, like you’re visiting relatives. Peng greets all his usual customers by name and loves to chat with them. He talks about the fish he’s caught (the man really loves to fish). He tells you about his children and always asks about yours. And I’m not the only customer whose order he knows before it’s ordered. At Sister Noodle House, the service is at a level you don’t typically get on our transient little island. It’s also one of the only spots on the island where you can get traditional Vietnamese pho, which I’ve heard is a foolproof hangover helper (not that I would know). Each bowl comes with your choice of protein (tofu, chicken, rare steak, beef tripe or meatball), bean sprouts, jalapeños and a wedge of lime. It’s so good it leaves you wondering if it’s pho real (sorry, I had to). Diners can substitute tofu or seafood for most meat dishes, and the menu also has a vast number of vegetarian options. Noodle dishes, like lo mein and mei fun, are filling and full of vegetables. Like most Asian restaurants, Sister Noodle House also offers all your favorite classic Asian dishes — General Tso’s chicken, fried rice and egg rolls, etc. — in addition to more traditional recipes. So whether it’s raining or the sun is shining, Sister Noodle House is always a good idea. It’s at 2502 North Roosevelt Blvd. in the Conch Plaza shopping complex. There’s free on-site parking and take-out or dine-in options. Head on over and get yourself some dumplings.